Music is the reason for our hobby and there are many approaches that make sense depending on our needs and wants. I have only once in fifty odd years of hifi, ever owned a commercially built speaker and it left precipitously in a box, as a present to a friend. This was my first and last home encounter with an electrostatic speaker (of a very well known and thought of make). The speaker did all it was supposed to - 30 Hz to ultrasonic, wonderful micro dynamics, the timbre fine - but incapable of playing at elevated or concert level and very poor in macro dynamics. Over the years I have heard many electrostats and they all suffer from this lack. Cone speakers, in all sorts of boxes, also to my ear have faults which preclude them from being of interest to me. One of, if not the biggest fault, is the lack of sensitivity, as for my tastes 100 dB/1 Watt and better is the starting point. Sorry, I know this sounds opinionated (synonyms for: dogmatic, assertive, arrogant, etc), but where would we be without having our own views? What I would really like to have is an example of the Living Voice Vox Olympian, but being of shallow pocket I have had to try and build towards this goal. 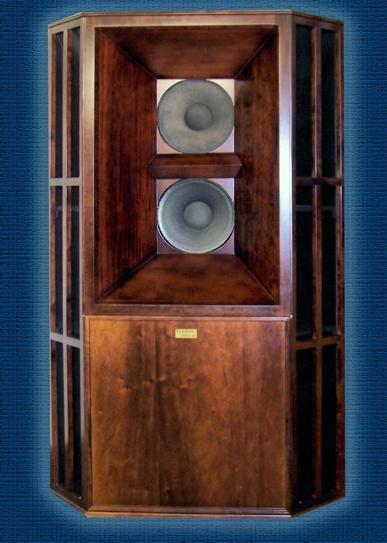 For the last 15 years I have played around with Tannoy Autographs and ended up altering the design and building what I called the Double Autograph. This was huge, standing 1.8 meters high with two 15" Monitor Golds per side and supplemented by ribbon speakers to assist mid range and treble plus super tweeter. Each cabinet had 65 panels, most with strange angles and scaled up from the Autograph wood thickness of 12.5 mm to 32 mm and faced with Imbuia wood. Weight is 285 kilograms each! Not for the faint of heart. For that I got slightly over 100 dB efficiency and the ability to play sustained organ music at 106 dB at 6 meters, if I wanted. When I built the things I had a pipe organ in the same space which also, when played flat out, raised 106 dB. Then I added a DIY Overboard subwoofer. Six months ago I had the chance to acquire a pair of Altec A7 clones with Fostex 16" main driver, HF driver and metal horns and a JBL bullet tweeter as a part swap for the Tannoy 12" rear loaded horn I had built, DIY 12" Tannoy Horn. The moment I listened to the A7 clone I was hooked. Sure there were glaring faults, the previous owner had the HF drive screwed right up and the tweeter was mis-connected, but right off the dynamic drive made everything else I had listened to before seem wimpy. Including the big Double Tannoys. These speakers had obviously done a lot of work as the wooden cabinet had outward scrapes and the HF Aluminum metal horns were somewhat corroded. What was of concern was the metal HF horns rang like a bell when tapped, so either they needed to be damped or replaced with something else. Inside the main cabinet, however, all was pristine, likewise the HF drivers themselves are in excellent condition internally, outwardly the paint was a bit worn. No matter as they worked just fine! The JBL075 tweeter was a concern until I realised that it had been connected up wrongly and was barely making a sound. Something that needs to be mentioned is that the Altec A5, A6 and A7 use the same main cabinets, the 828. The difference between A5 and A7 is the HF horn: the former uses one of the multi cells, the latter the sectoral type horn. By definition, then, the one on the left is an A7 type. Fostex made these cabinets and the only difference that I have been able to find is that their design is 100 mm smaller front to back. Otherwise they are identical to the Altec plans. Because of the corrosion of the metal horns, plus the ringing problem, I decided to have wooden multi cells made up. For those that decide to do the same, I used a simple exponential curve with a mouth of 10 mm square and tapering out to 100 mm square. There are different ways to make these, my woodworking chap made each side of the individual horns from solid wood and then glued and screwed them together. This was a very difficult way of making the multi-cell horns but, as each small horn consistes of four solid bits of wood, the end result is without resonances and quite heavy. The wood used is Jacaranda and finishes to light golden colour. Each horn mounts in a panel which is the width of the A7 cabinet. The Fostex HF compression drivers have a manifold and the manifold connects to the wooden horn. There are many ways of building horns if, like me, you like DIY. Failing that in Europe or the States second hand ones are often advertised and can be damped externally. Along the line I acquired a pair of NOS 15" Goodmans Audiom speakers and decided that, while one set of A7's is good, two must be better; so I commissioned another pair of cabinets. 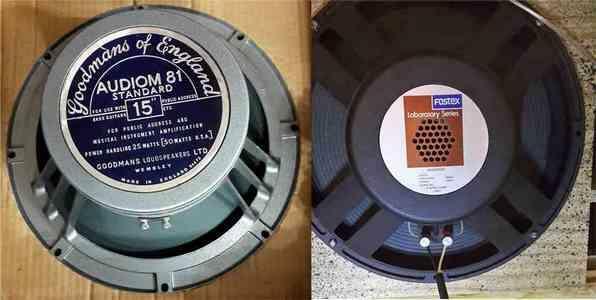 The idea came from the picture below left and is of an early Altec A6 stacked pair. 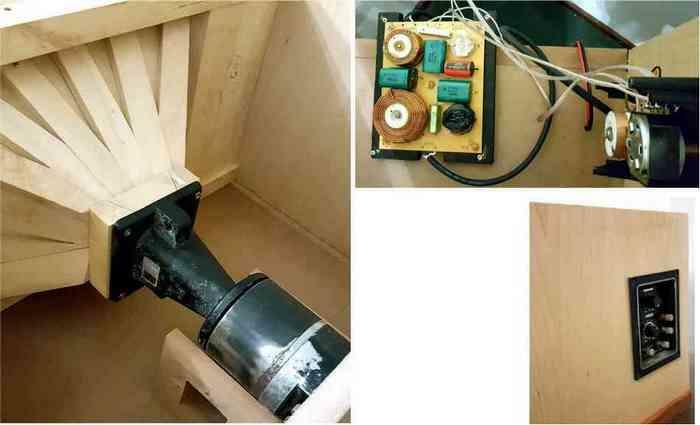 One change I will make is to set the HF horn between the A7 cabinets and that will be Part 2 of this article. 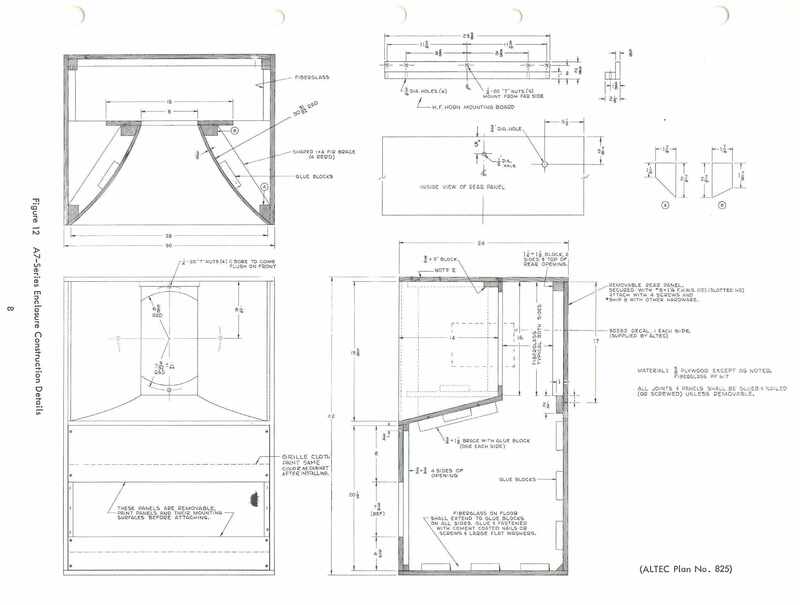 The above shows the second set of A7 cabinets, the center sketch is only for interest as the actual plans are here: Lansing Heritage, A7 plans. These date to 1968 and I have made certain modifications to the build and not to the actual design. For the Imperial or Metric challanged 25.4 mm = 1 inch. The cabinet walls and horn have been increased in thickness to 32 mm and the support ribs behind the horns have been increased from 3 to 5. 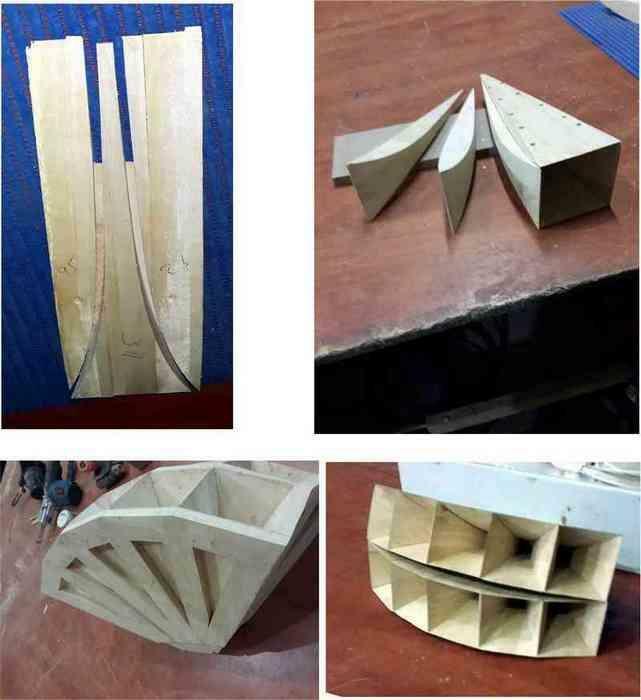 The horn sections were formed from three 10 mm layers of Supawood or medium density MDF with a 4 mm layer of veneered board. This is the only part of the cabinet build that takes any real skill. Note how the driver is partially covered by the horn - this is very important as it mass loads the front of the driver. All Altec designs rely on this feature. Mounting the driver back in the cabinet also helps time align the HF driver which, mounted on whatever horn used, is fairly long. 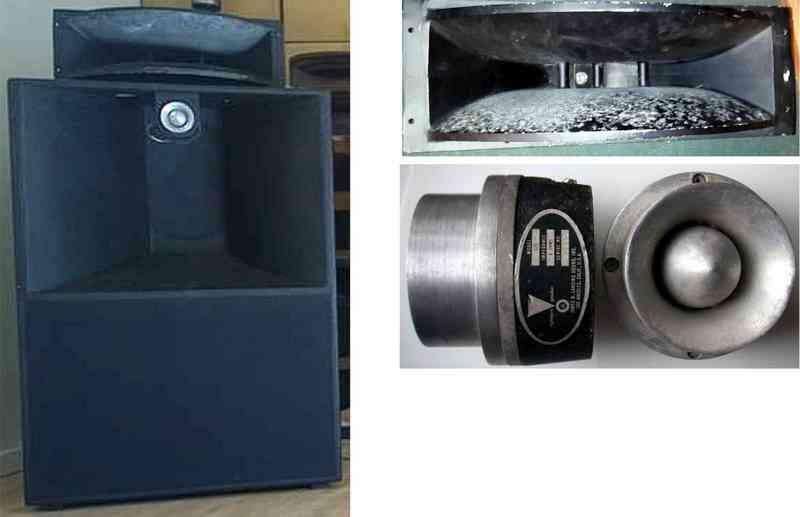 Variations of this type of cabinet include one where the port size is increased to allow mounting the HF horn inside the cabinet so as to make the speaker assembly smaller. Shown at left the bracing for the horn flare. The cavities behind the horn to be packed with fibreglass wool. I have tried modern materials and always end up going back to fibregless. The Voice Of The Theater range started in 1946 (one year before me!) and continues to this day. The cabinet on the right is inverted, the port removed and the HF horn mounted in the cabinet. WAF even then perhaps? There was some hype that Altec Lansing had re-released the Legacy A7 VOTT, but subsequent Internet searches came up blank for an actual sales point. Down now to the nitty gritty of drivers. The Fostex clones were fitted with 16" L475 Laboratory series units and the extra set of cabinets with 15" Godmans Audiom 81. Both have a resonant frequency of 25 Hz, but from there everything is different. The Fostex is 8 Ω, the Goodmans 16 Ω; the Fostex is rated at 150 W, the Goodmans at 25 W. Sensitivity for the Fostex is given as 100 dB/W and no rating for the Goodmans, but listening to them they at least the equal of the Fostex. The Fostex weighs in at just over 8 kg, the Goodmans over 10 kg. Both have ALNICO magnets. Voice coils Aluminium, 100 mm for the Fostex and 75 mm for the Goodmans. The HF compression drivers are Fostex D252 and are quite heavy at 3.3 kg each. One inch or 25.4 mm throat, ALNICO magnets with Aluminium diaphram. They are crossed over at 600 Hz and run up to 7 kHz where the JBL075's take over. Sensitivity is 105 dB/W via the original metal horns and are now slightly better than that with the multi cells. Anyone wanting to embark on a project like this can pick and choose from many modern compression drivers or source old types as they choose. Altec, JBL and even Westrex drivers are advertised on the net, at a price. For the well heeled GIP Labs in Japan or GOTO-Units. JBL, Peavy and VitaVox plus many other make compression drivers. The possibilities are endless. As in everything, it's up to your ears and pocket! The only reason I have used these Fostex units is that they came with the A7 clones I bought. After six months of listening to the Fostex A7 cabinets (leaving the HF section aside for now) I was very impressed with the clarity, dynamics and punch delivered so, when the time came to send those away for cladding in Imbuia and replacing them with the new Goodmans clones, I was a bit worried. To my joy, if anything, the new cabinets performed as well, but with a touch more bass and that left me a bit bemused. That is until my woodworking chappie rang me with a problem. 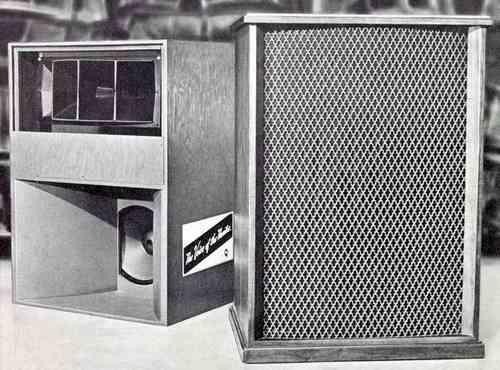 The Fostex cabinets were 100 mm (or 4") less front to back than the Goodmans versions, which were built to Altec plans. This is not serious as they will no doubt blend together in the final stack version, but it seemed odd that Fostex deviated from the Altec original. Both types, however, work essentially the same with almost no visable cone movement, even at very high levels with thumping bass. The dynamic response from this type of cabinet can not be overstated, it is enough to cause visitors to actually jump when there is a drum strike. Sitting back six meters from the wall, almost seven meters diagonally from the cabinet, there is a beat against the body and the heavilly upholstered chair shakes. I am certain this is a function of the cabinet design and have no doubt any reasonably sensitive driver will work equally well. Power needed for even very loud listening is minimal and my Stereo 20 Leak copes runs with the same drive from the preamp as do the 12" Goodmans Axioms in rear horn loaded cabinets. Except the end result is much higher volume in the A7 clones! The picture of the final Goodmans A7 clone with multi cell at right. The reason for the rectangular panel (actually a box) around the multi cell is to provide a resting place when the Fostec A7 clone is mounted, inverted, on the top. The tweeter will stay more or less in the same position height wise in the horn mouth of the second cabinet. The Fostex A7 clone is being clad with Imbui finish, the walls thickned to just over 32 mm, likewise the horn flares, the flares being reinforced with extra ribs at the same time. 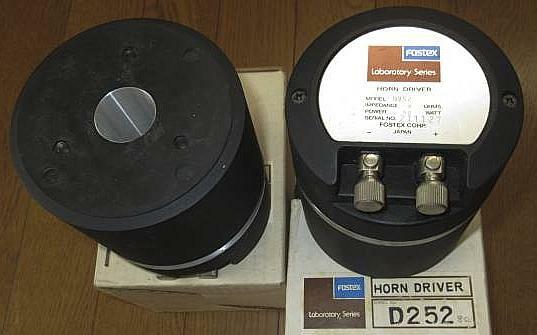 Shown at left is the back of the multi cell horn, with the Fostex D252 compression driver and manifold. The Fostex three way crossover and the control panel for that which mounts in the side of the multi cell enclosure. Controls are for HF and Treble gain. For interest, the crossover measures 200 mm X 160 mm. Final connections for the two main drivers have still to be finalised when the second set of cabinets are installed. The setting on the HF control is -20 dB from maximum as the HF/multi cell combination is much more sensitive than the bass side. When the other cabinets are in there should be a 3 dB increase in bass sensitivity. 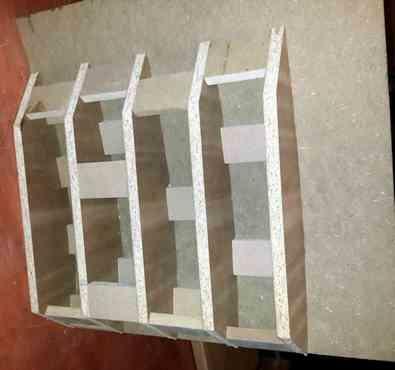 This construction may seem like violent overkill, visually it is at just under 1.5 meters high and 0.8 meters wide. Finished with the two A7 cabinets and multi cell it will be 2.55 meters high. Altec claim that one A7 cabinet plus HF horn is suitable for a theater seating 800 people in mono, the stacked cabinets pictured above are rated at 1,000 people (3 dB increase roughly). Two and two in stereo 2,000 maybe? That aside what it really comes down to is absolute and total effortlessness in reproduction. It can play loud, very loud, it is without hearable distortion at any level I can stand and remains free of any compression and has no discernible limit insofar as peaks in any music. For peaks see Jon Leifs Saga Symphony and beware your computer speakers! There are some issues. Not much bass below 40 Hz, but I have a sub for that, DIY Overboard sub woofer, and setting up the HF level takes a bit of fiddling. Imaging is spot on and the scale is as per the recording. With solo violin or with orchestra and organ the size expands and contracts as it does when you listen live. I have never heard a speaker system that reproduces the venue ambiance as well as these horns do. The audiophile nuts that obsess with detail are well covered here due to the combination of high pressure drivers with efficiencies above 105 dB/W. Earlier I mentioned comparing them to an electrostatic speaker and I can't think of one attribute or place where these horns are bettered by the panels. Except for the weight of the finished cabinets! The perpetual myth of horniness that horns speakers are supposed to suffer from just doesn't happen. Horniness is colouration brought about by either bad design of the horn or by resonances in the horn which amounts to the same thing. The multi cells are simple exponential flares kept small and solid as can be seen in the pictures. 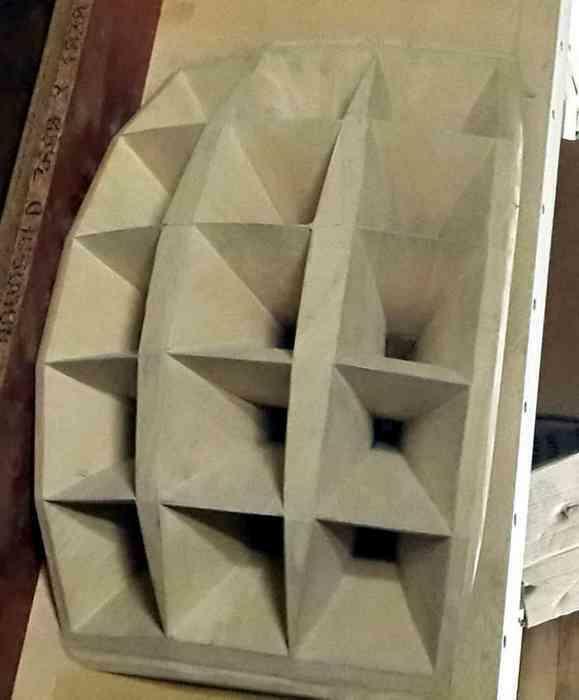 Once you have heard a properly built and set up horn speaker every other speaker you listen to will seem lacking. Even small Lowther type horns have the ability to bring out realism in music albeit at reduced volume. A reasonably simplistic primer in what your system needs to be capable of can be found here, What's in your Music, a more advanced work on loudness control by pianists (the piano is used here only as an example of sound pressure levels) Kinoshita et al. The modern trend in speaker systems is low efficiency, 90 dB downwards, and crank up the power to compensate. At 90 dB sensitivity only 0.62% of the power applied is converted to sound the rest, or over 99%, is wasted as heat. Then the voice coil heats up and the efficiency goes down even further. The speaker system above is well in excess of 100 dB/W/meter and that means very low power input and when there is a loud peak the amplifier needs only a handful of Watts. For a more complete discussion on this, Loudspeaker Power Handling Vs. Efficiency. What this translates to with the A7 Clone is very low wattage for more than enough volume. No thermal buildup in the speakers, minuscule amounts of distortion and huge dynamic ability. Another big advantage, which comes as standard with this type of speaker, is almost non-existent cone movement. This means the time needed to move the cone backward and forwards is reduced which equates to speed. With very loud thumping bass the 15" cone just trembles, the total cone excursion is less than 2 mm at stupidly high volume. The table at right explains the power needs of a system with differing speaker sensitivities. 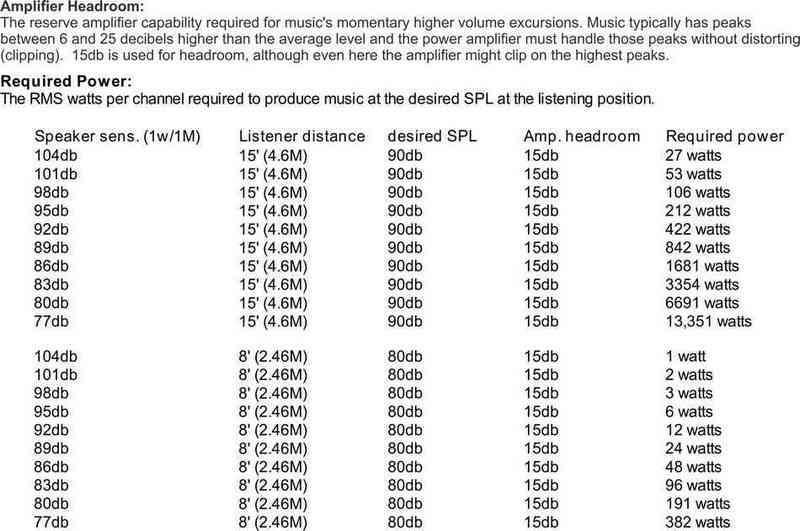 From the link What's in your Music, 90 dB levels are not particularly loud. If you stand next to someone playing a concert grand piano expect upwards of 103 dB - a pipe organ can reach far above that even on a Cathedral floor. This means if you want realistic levels in your home your speaker and sound system must be capable of at least sustaining 90 dB + 25 dB peaks = 115 dB. Where does your system fall? The right hand side of the table is for only 15 dB peaks and remember the dB scale is logarithmic. 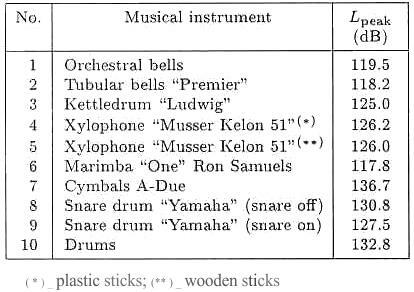 Some peak levels close to percussion instruments. To be able to reproduce these properly at concert levels requires a fair bit of headroom in a system. Having a loudspeaker that can cope with any dynamic demand at concert level is without price. I have heard low sensitivity speakers clip badly even when driven by fairly powerful solid state amplifiers, usually to the detriment of the tweeters. With a speaker such as the A7 clone above there is no fear of that, even driven with 5 W. With a bit more they can be thunderous depending on the program material. Piano can be very demanding of a system, The Devil's Staircase by Gyorgy Ligeti is an indication. Now imagine this played as loudly as it would be if you were standing there. This speaker will do it with no strain and as in the link earlier, Jon Leifs Saga Symphony, they cope well (usually visitors hearing this bit of music jump with surprise) as they do with Tchaikovsky's 1812 Overture, cannons and all. Small more intimate works work well too and so far I have found nothing that they don't play well. Bad recordings are.....bad. Nothing is perfect, but there are ways to overcome most problems and the biggest one here is the size of the cabinet, not so much for how the cabinet works in a small room but not many wives would put up with a pair of these in her sitting room! Again, I mentioned earlier the A7 clone does not go down much below 40 Hz - the frequencies are there but much reduced (roll off). If all you listen to is Jazz or Rock then a sub is not really needed, but it's nice to have. A problem here is to find a sub that can match the speed and supply the volume to blend in with the A7 clones. I place the cabinets in the room corners, which helps with bass. The biggest problem is something that all audio types must cope with and that is the speaker/room interaction. There are ways around that, room treatments, bass traps and lots of soft furnishings, amongst others. I choose to use Tact/Lyngdorf Room Correction, but there are other types and makes that do the job as well. Behringer for example, make an inexpensive equalizer which can measure the room and go a long way to getting rid of peaks and dips. The system I use takes care of any Time Alignment issues, such as the forward mounting of the JBL tweeter/super tweeter which of necessity has to be in that place. The magnet structures of the main drive unit and HF driver are almost in line vertically but, as always, crossovers have some effect on time alignment. There is a new room correction system that holds out some promise, Dirac Room Correction, which might be worth a try, especially as they offer a free trial period. I can not recommend these speakers more highly - they do everything that any audio type would want plus they are musical. It does not matter the source, LP, tape, CD or server, they make music. One last link for the terminally insane: Ancient Audiophile. Again as mentioned in the beginning, this is not a recipe, more a prod in the direction of bliss! WARNING! This speaker system can easily damage your hearing as it can sustain very high volume levels.